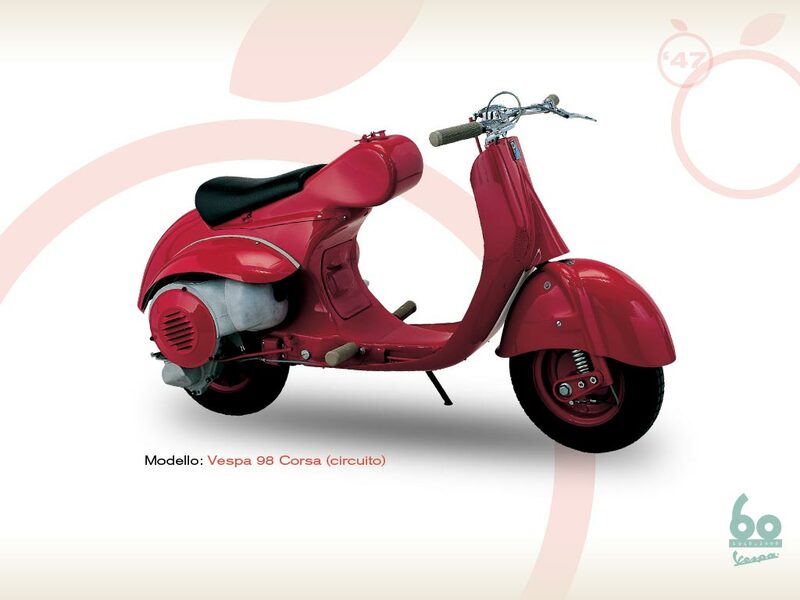 The creative genius of Piaggio's engineers, which had led to the appearance of the first Vespa on Italian roads in 1946, was confirmed a few months later by the emergence of a real jewel from the experimental division of the Pontedera workshops. The Vespa 98 Corsa was built with the specific objective of showing the world that a small scooter could be extremely competitive on the circuit. The "silver swarm" of Vespas that had taken over Italian roads and piazzas inspired Enrico Piaggio to produce a vehicle with an "aggressive" design that would race to win. The Vespa 98 Corsa (Circuit) was hence built for speed in the races of its category and represented a concentration of innovative ideas to be tried out on standard production. It mounted the steering column and suspension on the right, a solution that would be applied to the Vespa 125 from 1948 on. The body was handbuilt on a steel frame. The brakes were drums; the rear had an air intake for cooling. It had the three-speed gear with the lever on the handlebar. Cooling was through forced air, ignition through a flywheel magneto with an internal coil. The clutch had multiple steel disks in a wet sump. The carburettor was a 17 mm Dell'Orto. The vehicle's original colour was red. It was a little “meteor" to dream with and inspire dreams on in those first few Vespa years. Tyres: Pirelli of the “corsa” type, 3.50-8"